If it's not already clear, Kellogg's Pop-Tarts Frosted Strawberry snacks aren't fruits. Now an advertising self regulatory group is saying they contain so little fruit that the product's packaging, featuring a prominent "Made with real fruit" statement and big pictures of strawberries, is misleading. 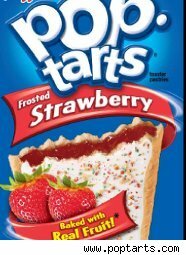 Noting that the product's nutrition label says Pop-Tarts Frosted Strawberry has less than 6% fruit and less than 2% strawberries, the Council of Better Business Bureau's Children's Advertising Review Unit is calling for Kellogg's to make packaging changes to make sure children aren't misled. CARU, as the group is called, monitors ads directed to children on behalf of major advertising associations. Its tries to ensure that ads for products directed at children under 12 are accurate, making sure, for instance, that toy planes shown flying through the air in a TV ad really can fly when a child gets it home. Under Congressional pressure, the group has stepped up its review of children's food ads in recent years. Some CARU reviews stem from consumers and competitors complaints, but the group also reviews ads for children's products on its own and that's what happened with Pop-Tarts. CARU said the appearance of a "cut and collect" promotion offering awards for collecting Pop-Tarts cartoon character and a kids-aimed web page prompted the review. The group wasn't happy with what it found. "CARU determined that the express claim, 'Made with Real Fruit' combined with the pictures of strawberries all over the package could easily lead a child to believe that the product contains substantial amount of strawberries," said CARU in a case report released Monday, Mat 24, 2010. The report cited the same problems with other Pop-Tarts flavors. "CARU determined that packaging for those products also implies to children that the product contains substantial amount of fruit." Kellogg told CARU that Pop-Tarts marketing isn't "primarily directed to children" and is intended at the primary grocery shopper. It also said "cut and collect" promotion ended last Dec. 1. It said in a statement to CARU, Kellogg said it would "take CARU's decision into consideration on future advertising." The company reiterated to Consumer Ally the view that Pop-Tarts advertising isn't directed at kids. "Kellogg does not advertise Pop-Tarts toaster pastries to children under 12," said Kris Charles, a company spokeswoman. "We used the 'Made with Real Fruit' claim in question in adult-targeted media, including print, television and online and it appears on front of (the) pack. We do not consider the front of pack label to be advertising directed at children." The announcement of CARU's concerns comes just a week after Kellogg's CEO David Mackay joined First Lady Michelle Obama in announcing a major commitment by food companies to help her Let's Move initiative by reducing the calories in children's foods. Members of the Healthy Weight Commitment Foundation that Mackay chairs pledged to reduce 1.5 trillion calories in children's products by 2015, either through reformulating products or cutting serving size. The announcement followed a government report raising some issues on current foods for children. Kellogg is also a member of the Children's Food and Beverage Advertising Initiative and in 2007 promised to take major steps on its marketing of food to children, including not advertising Pop-Tarts to children under 12. That initiative is aimed at advertising, not product packaging. Pop-Tarts is hardly alone making this sort of a claim. The Center for Science in the Public Interest released a report about misleading food labeling that includes Gerber Graduates Juice Treats Fruit Medley, which has but 2% raspberry juice and no other elements of the medley. Another example: Betty Crocker Strawberry Fruit Gushers, which claims to be "Made with real fruit," but has no strawberries -- just a small amount of pear concentrate.